You can often hear people complaining from various problems with their rechargeable NiCd or NiMH batteries and saying that the problem is caused by the so called “memory effect”, however in truth it is mostly because of improper usage and handling of the batteries. The term “memory effect” is not the best one to describe the issue as the “true memory effect” is not something that you can achieve unless in specially controlled conditions, so a more accurate description is “voltage depletion” or “voltage depression”. And while “memory effect” is the most commonly used term usually they all refer to a drop in voltage and thus resulting in a loss of capacity of a battery due to partial discharge and repetitive full charges without going for a full discharge-charge cycle. 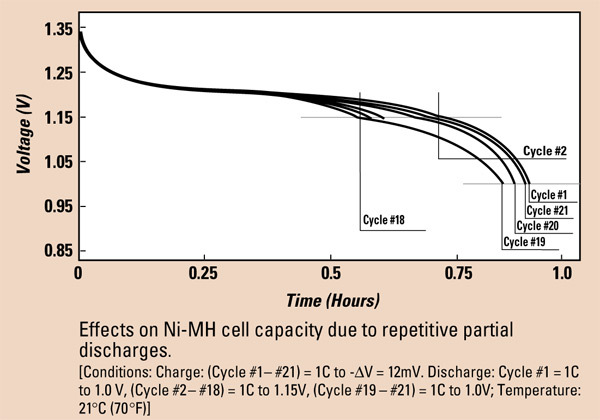 The problem was first observed with NiCd batteries and NiMH cells do seem to suffer from it as well, but to a smaller extent and the usual problem causing the so called “memory effect” is when user constantly charges his batteries in order for them to be always ready for use with the maximum capacity. Due to the fact that the newer LSD (Low Self Discharge) NiMH batteries do self discharge much slower compared to traditional NiMHs, they tend to be less prone to such problems as there is no need to top them off frequently in order for them to be always ready to be used. Fortunately, this effect is reversible and all you need to usually do is one or two full cycles of a NiCd or NiMH battery (discharge/charge cycle) down to about 1V (it is not recommended to discharge to 0V!). Doing so should normally restore a NiCd or NiMH battery to its full voltage and thus the full useable capacity. The good thing is that if you handle properly your rechargeable batteries and do a full discharge/charge cycle once in a while you should not have to worry about getting problems with the so called “memory effect”. The reality however is such so that in almost all cases when users are experiencing problems with their rechargeable batteries it is usually caused by improper handling, overcharging/overdischarging or improper storage and is not associated with the “memory effect” at all. Actually the improper use and storage also is the problem that you are unable to fully utilize the capabilities that other rechargeable batteries such as LiIon, LiFe and LiPo batteries offer as these do not have issues associated with “memory effect” that you can blame. So the next time you have a dead rechargeable NiCd or NiMH battery think about how you handled and used it before blaming it all on the “memory effect” as it probably had nothing to do with the fact that you’ve left the battery cell to get fully discharged to 0V for example. Have in mind that the negative effects caused by the “memory effect” or more precisely said by “voltage depletion” or “voltage depression” such as loss of voltage and thus useable capacity are fully reversible, however the same problems caused by overdischarging or overcharging a battery repeatedly are not!